After surveying areas north and east of present day Jackson, Thomas Hinds, James Patton and William Lattimore proceeded southwest along the Pearl River until they reached LeFleur's Bluff in Hinds County. They reported to the General Assembly that this location had "beautiful and healthful surroundings, good water, abundant timber, navigable waters, and proximity to the Natchez Trace. A legislative act dated November 28, 1821, authorized the location to be the permanent seat of government for the state and ordered that it be named Jackson in honor of Major General Andrew Jackson who would later become the seventh President of the United States. During the Civil War, the town was ravaged and burned three times by Union troops under the command of General William Tecumseh Sherman. Surprisingly, the City Hall, which was built in 1846 for less than $8,000, was spared the torch. 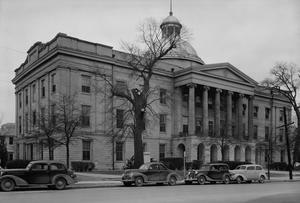 It was rumored that Sherman bypassed the building, which is still the working seat of municipal government, because it housed a Masonic Lodge and that the Union leader was a Mason. More likely, its use as a hospital was the reason the building was not burned. Although less than 8,000 people lived in the Jackson area at the turn of the century, its population began accelerating rapidly after 1900, and it became one of the dynamic growth areas of the Sunbelt. The latest census figures put Jackson's population at 184,256. The year 1985 marked a change in the form of government in Jackson. During a special election, in the fall of 1984, citizens voted to replace the three-man commission with a mayor and commissioners elected at-large to a mayor-council form of government. The process allows for the mayor to be elected at-large and seven council members elected from wards. In association with Varna, Bulgaria; Tokyo; and Moscow; Jackson hosts the world-class USA International Ballet Competition at the beautiful municipal auditorium, Thalia Mara Hall. The city-center arts complex also includes the nation's 10th largest Planetarium, which houses the unique 870 large format cinema or "wrap around" film projection system and Mega HD Cinema large-screen format. The Mississippi Arts Pavilion, which hosted the Palaces of St. Petersburg, the Splendors of Versailles, the Majesty of Spain, and the Glory of Baroque: Dresden exhibitions, was renovated to become the new home of the Mississippi Museum of Art. A new downtown convention center and adjacent telecommunications center accommodate a variety of large events.